Pase un día completo explorando Mumbai con un guía informativo que comparte los mejores momentos de la bulliciosa ciudad india. Ver atracciones como La Puerta de la India construida en Gran Bretaña, el Museo del Príncipe de Gales, el Templo Jain, Dhobi Ghat y mdash; una famosa lavandería al aire libre, y el Mani Bhavan Gandhi Sangrahalaya — un museo sobre Mahatma Gandhi. Conduzca por Malabar Hill y Marine Drive, luego haga una parada en un mirador del Mar Arábigo. Espere aprender mucho sobre la historia de la ciudad de su guía en este recorrido completo. 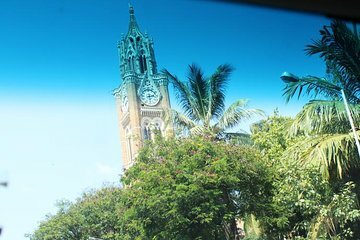 Vea las principales atracciones de Mumbai con una guía experta. Great way to see Mumbai until in the afternoon the guide started putting pressure on to stop and shop. Thought we were going to a mall for washroom and bite to eat but was an expensive shop. I was very happy with the guide and driver, and they did their best. But the reality is that there is not an awful lot to see in Mumbai - it is after all a commercial centre and not a tourist location. Nevertheless, it was my first time to India and so everything was interesting. I'd certainly recommend the tour to a first-timer in Mumbai. Overall a good tour. Very comprehensive. My only complaint is that a lot of it is from the car, meaning you don't get to walk much. The guide and driver were great though. We loved the tour,amazing experience and highly recommended this Mumbai city tour, within this low cost its highly worth,comprehensive tours and good caring guide and driver made a perfect trip for us.thanks you so Much Viator and Team.